At Soft Surroundings, our women's tees are anything but ordinary. 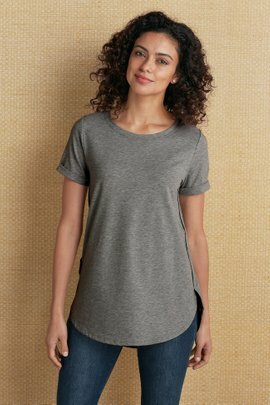 Available in a range of styles, colors, and fits, you'll find the tee that is perfect for you.For many women, T-shirts are a wardrobe staple. They can be worn with jeans for a casual look, or can be dressed up with a cardigan or jacket. We sell several lines of straightforward shirts in solid colors that will soon become the most versatile pieces in your wardrobe.Some of our tees, on the other hand, definitely stand out. Some are embellished with unique details such as embroidery or beads, while others come in eye-catching paisley's, prints, and plaids.As you've come to expect, all of our T-shirts are incredibly soft. You can always check the “softness rating” to see just how soft the shirt is. Take a few moments to browse our selection and pick out something wonderful for yourself.